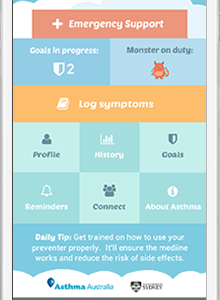 We’ve discovered a new app that might get your kids interested in managing their asthma! It was designed by kids for kids. Approximately 22 percent of young people with asthma between the ages of 15 – 25, report taking time off school or work because of their asthma. In attempt to reach this community researchers developed the app to aid young people manage their asthma. The app has many features including access to forums to connect to other young people with asthma, information about asthma, videos on how to take the different medications and medication reminders. Kiss My Asthma app is a free download available from app stores.